If you could have fillings that matched the natural color of your teeth so well that nobody could tell the difference, would you choose them over metal? We thought so! Both scientific studies and clinical experience have shown that tooth-colored restorations (fillings) are safe, reliable and long-lasting. Plus, they look great. Not only do tooth-colored fillings offer an aesthetic alternative to “silver” (dental amalgam) fillings that's hard to match — they may also allow for a more conservative treatment method that preserves more of the tooth's structure. When you put these advantages together, it's no wonder some dentists say we're moving toward a “post-amalgam” era. 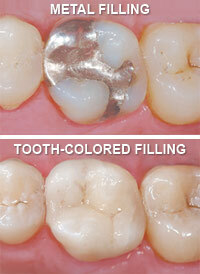 Tooth-colored fillings are made of a blend, or “composite,” of plastic resins and silica fillers. These substances mimic many of the qualities of natural tooth structure, such as wear-resistance and translucency. Dental composites also help strengthen teeth. Based on looks alone, it's easy to see why you'd want a tooth-colored restoration in the front of your mouth. But to understand some of the other advantages composite resins offer — even for back teeth — let's look a little closer at the tooth restoration process. There are many reasons why a tooth may need to be filled or restored: decay and chipping are two common ones. No matter which material is chosen, the procedure is almost the same. After the area has been anesthetized (usually by a numbing injection), the tooth is “prepared” by removing decay and making it ready for the restoration. Next, the filling material is placed directly into the tooth. Once it has securely bonded to the tooth structure, the process is essentially complete. Now, here's the difference: In order to achieve a good structural bond with a traditional amalgam filling, it is often necessary to shape the tooth by making a series of “undercuts” that help hold the material in place. This means that some healthy tooth material must be removed, leaving less of the tooth's structure intact. In time, the structurally-weakened tooth can be prone to cracking. But composite resin fillings don't require undercutting to make a strong union — instead, they form an intimate physical and mechanical bond directly to the prepared tooth. This more conservative treatment may ultimately lead to a better and longer-lasting restoration. When Can Tooth-Colored Fillings Be Used? Composite resins are generally appropriate for small to moderate-sized restorations — which encompass the most common types of fillings. They are durable, fracture-resistant, and able to withstand chewing pressure. Depending on how much of the tooth needs restoration, the procedure may be accomplished in just one visit. Alternatively, if a large volume of tooth material must be replaced, a part may be fabricated outside the mouth and later bonded to the tooth. Whatever the situation, the best way to determine whether tooth-colored fillings are right for you is to come in and consult with us. We can explain the appropriate options and help you select the best way to proceed with treatment. Either way, you'll be able to achieve — and keep — a healthy-looking smile.